Revolution or evolution? both words are powerful, both lead minds to discussion, both words are able to change ones perception, both of them can be an inception of something great or conclusion of something existent. The distinction between these two radically abstract conditions is very deep in understanding, in history and in their consequences. Revolution in brief is the end of static state passing to vague future, while evolution is an organized structure leading to something premeditated. The theory of Bjarke Ingles "Yes is more" draws into a full cognition of evolution in architecture. Every point of view, every thought, and every necessity must be taken into consideration, complexity is the only key to success. Comfort and modern visual of an architectural creation cannot be reached by simple attitude and plain thinking, every detail has a significant meaning and should be appreciated and respected fully. There is a minimal possibility for a superficial intention to become something estimated in architecture. It is a must for a building to be perceived by ordinary people, by the society who will use it in everyday life and who will be the most fair and true judges of the creators. Architecture is an opportunity to give life to materials artificially but without care, without foresee of needs of human beings, without critical thinking, without complex articulation of every topic, without full dedication of time and mind intended evolutional effect cannot be attained. The traditional image of the radical architect is the angry young man rebelling against the establishment. The avant-grade is defined by what it is against rather than what it is for. This leads to an oedipal succession of contradictions where each generation says the opposite of the previous. And if your agenda is dependent on being the opposite of someone else's - you are simply a follower in reverse. Rather than being radical by ignoring the context, the establishment, the neighbors, the budget, or gravity, we want to try to turn pleasing into a radical agenda. What if trying to make everybody happy did not have to lead to compromise or the lowest common denominator? It could be a way to find the ever elusive summersault that twists and turns in order to fulfill every desire and avoid stepping on anyone's toes. Rather than revolution, BIG are interested in evolution. Like Darwin describes creation as a process of excess and selection, they propose to let the forces of society, the multiple interests of everyone, decide which of our ideas can live, and which must die. Surviving ideas evolve through mutation and crossbreeding into an entirely new species of architecture. Human life evolved through adaptation to changes in the natural environment. With the invention of architecture and technology they have seized the power to adapt our surroundings to the way around. This is what makes it interesting to be an architect: as life evolves, our cities and our architecture need to evolve with it. Our cities are not polluted or congested because they have to be. They are what they are because that's how we made them. So when something doesn't fit anymore, architects have the ability and responsibility to make sure that our cities don't focus us to adapt to outdated leftovers from the past, but actually fit to the way we want to live. Viewed in this way architects don't have to remain misunderstood geniuses, frustrated by the lack of understanding, appreciation or funding. Architects won't even be the creators of architecture but rather the midwives of the continuous birth of architectural species shaped by the countless criteria of multiple interests. The whole world insists on conflict. The media craves conflict, and the politicians craving media presence need to engage in conflict to get there. What if the design could be the opposite of politics? Not by ignoring conflict, but by feeding from it. A way to incorporate and to integrate differences, not through compromise or by choosing sides, but by trying conflicting interests into Gordian knot of new ideas. An inclusive rather than exclusive architecture. An architecture unburdened by the conceptual monogamy of commitment to a single interest or idea. An architecture where you don't have to choose between public or private, dense or open, urban or suburban, atheist or Muslim, affordable flats or football fields. An architecture that allows you to say yes to all aspects of human life, no matter how contradicting! An architectural form of bigamy, where you don't need to chose one over the other, but you get to have both. A pragmatic Utopian architecture that takes on the creation of socially, economically and environmentally perfect places as a practical objective. 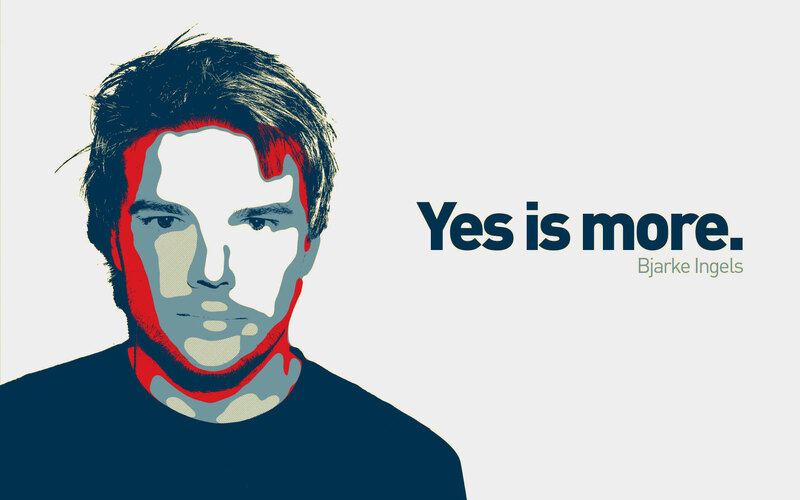 Yes is More, Viva la Evolucion! Sustainability is often associated with some puritan concept where you are not supposed to take long warm showers or take long distance flights for holidays - Because it's not good for the environment. So gradually, you get the idea that sustainable life is less fun than "normal" life. What if we could focus on examples where sustainability actually increases the quality of life? Where a sustainable lifestyle isn't pain - but pleasure. So when BIG was making the project of Danish expo in Shanghai they asked themselves - what could Denmark possibly show that would be relevant to the Chinese? - And they began to make comparison between the two countries. They found out that 50 years ago in Shanghai broad boulevards were jam-packed with bicycles, but now the lifestyle changed with massive economic boom and urban explosion and streets are full of cars and congested with traffic jams, but in Denmark bicycle is becoming more popular and the car traffic is reduced, the bicycle has become a symbol of sustainable city and a healthy lifestyle. They even have a so-called city bike that visitors can borrow for free and move around town before they return. So they decided to re-launch the bicycle as something attractive in Shanghai and donate 1001 city bikes to Shanghai that they can keep after the expo. It was the starting point of idea, BIG imagined the Danish pavilion as an infrastructure for the bicycles. Like a bicycle lane, looped around itself. Both Shanghai and Copenhagen are port cities, but in Copenhagen, the industry has been moved away or made clean. Former industrial sites have turned into parks, and the water has become so clean that you can swim in it. So they proposed to ship 1 million liters of harbor water from Copenhagen harbor to shanghai in a tanker (this idea could be accomplished for free). In the heart of the pavilion, they could create a harbor bath where all the visitors with the courage to do so could borrow a pair of swim shorts or a swimsuit and take a swim in real Copenhagen harbor water. And in the middle of this little piece of Copenhagen harbor they proposed to create a pile of rocks and place the actual little mermaid. Not a copy, but the real deal. 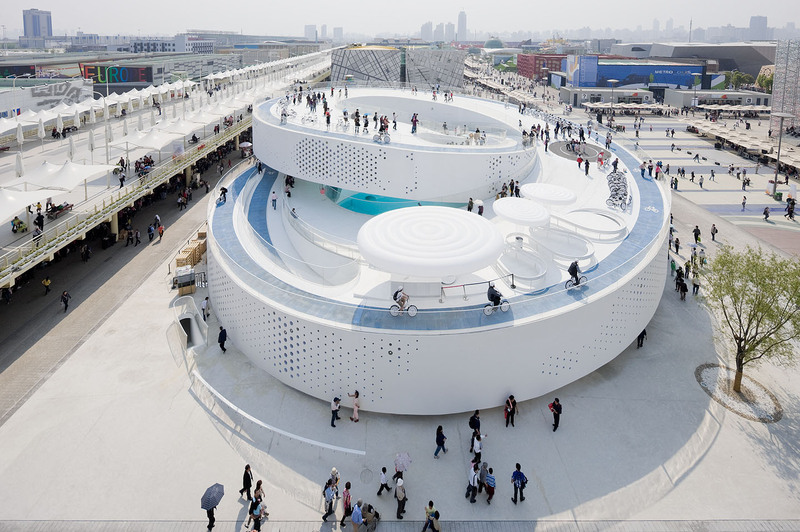 The pavilion itself is a linear exhibition curled lip on a double loop with the harbor bath in the center and the bicycles on the roof. People will arrive at the bath, move through the exhibition and reach the roof where they will go browsing for a bike. Mounted they will ride through the last part of the exhibition and go out into the expo area with bicycle. It's essentially based on the first rule of documentary - "show it, don't tell it". Rather than making a piece of state founded propaganda full of words and images but no real experiences from Copenhagen: people can enjoy from the possibilities which project gives to them. It's really exciting how every project of BIG says yes to everyone, like the ideology evaluates the existing value of architecture and gives opportunity to people to be satisfied by project and by space which sometimes is forced into unexpected forms and shares the surprise of seeing. © 2015 Aleksandre Andghuladze. All Rights Reserved.